I can't remember where I saw this recently, but I think it was on one of the blogs that I follow, and I pretty much started to drool. 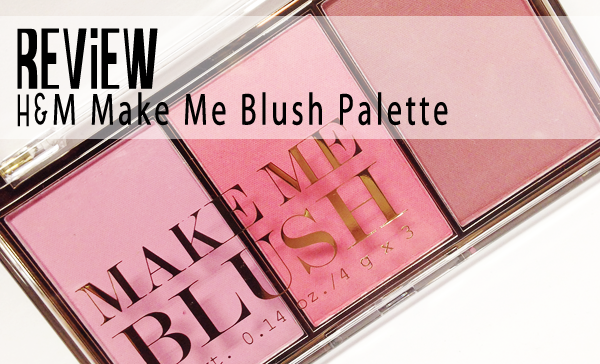 Lately, I've been all about blush shades that run more mauve or blue toned. I've even been thinking about breaking down and ordering a straight up lavender blush from South Korea, since those are the only places I've seen true lavender blushes recently. Anyway, as soon as I saw pictures of this palette I felt like I absolutely needed to try it, and now that we've finally gotten an H&M I popped in and picked it up. To be perfectly honest, when I saw the price tag of $5.95, I had a feeling I was going to be let down by the quality. But I wasn't. Trust me. You know we're going to start with the packaging. Honestly, the packaging does leave something to be desired, but at a $6 price tag I feel like beautiful packaging would be asking too much. The container is bronze plastic on the bottom and clear for the lid with with gold printing. I actually do like what they've done with what they have, keeping it slim and sleek without too much crap on it to make it look like something other than what it is. I will also say that I'm incredibly happy with the way it snaps tightly closed and holds. I have no fear about tossing this into a bag, which combined with the colour selection makes it really convenient for travel. 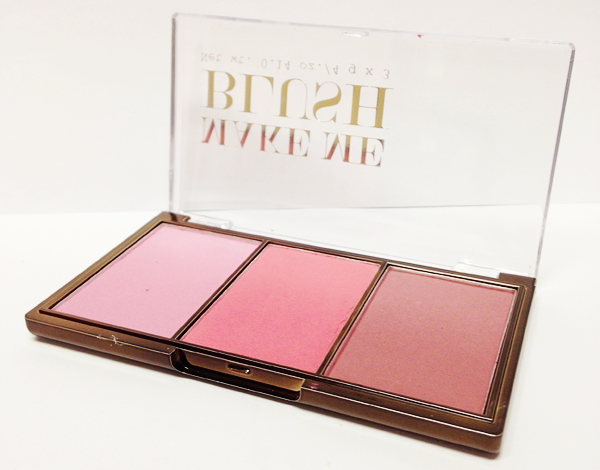 This palette contains three shades: Pink, Bright Pink, and Plum. Pink: A matte, blue toned Barbie pink. The texture on this shade is absolutely beautiful. It's soft and creamy without being at all powdery and it's very highly pigmented. Bright Pink: A matte bright pink that leans slightly more coral. 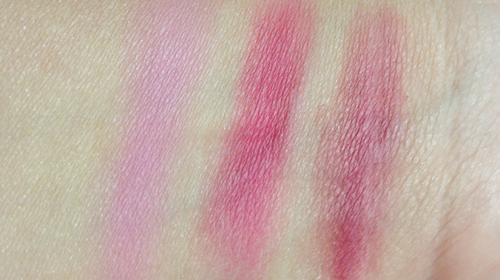 Highly pigmented and soft, this shade does come off quite a bit more powdery than Pink. Plum: A matte warm plum-y mauve shade. 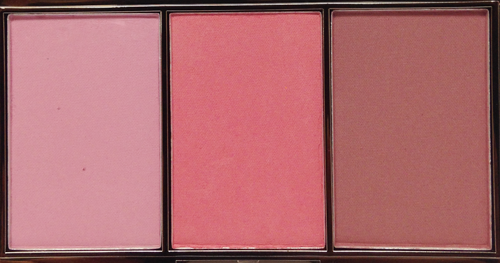 Again, highly pigmented and soft, not quite as creamy and smooth as Pink but not nearly as powdery as Bright Pink. I feel like this is a pretty perfect blush palette for fall and winter and could very easily work on a wide range of skin tones, from very pale to very deep. I feel like Pink is definitely more suited to lighter skin tones to give a fresh, baby-faced look as long as you use a light hand. Bright Pink, I think, could be a fairly universal shade if used with a light hand by us fair faced girls, but I think where it would really shine is on deeper skin tones. The real winner in this palette for me is the Plum shade, which pretty much hits on what I've been looking for lately. Again, because it's highly pigmented it does require a light hand. One tap of your brush and you're good to go if you have pale skin like me. I feel like this shade could also be really flattering on a wide range of skin tones, because it is so natural and sophisticated. 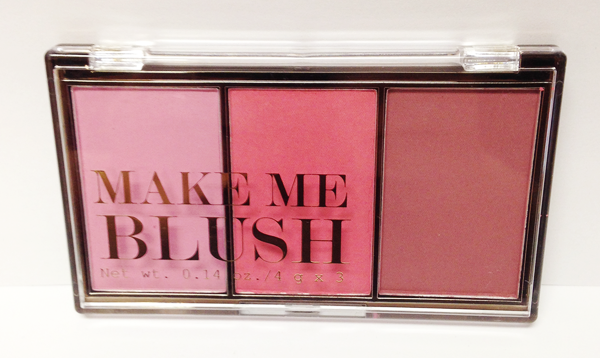 As a side note, the Make Me Blush palette also comes in another shade variety, containing a peach, a coral and a bronze shade and is also currently available at H&M. I have to say, this palette is a real winner for me and I think it will be getting a lot of play in coming weeks. It's perfect for this time of year and very versatile. For $5.95, I really feel like you can't go wrong with this palette and I have a feeling like at least a few of my friends are going to be getting this in their stockings from me this Christmas! Have you tried H&M Cosmetics? And if so, do you have any recommendations for me?